Clever llttle rockrose that deserves a place in a protected, hot, sunny aspect. Sage green dense foliage is a great backdrop to the spectacular 3″ wide cupped flowers. 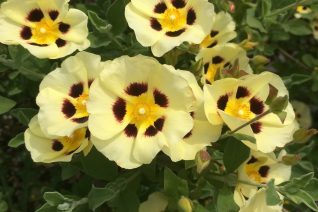 They are white with a zone of maroon at the base around a yellow center. Fun! Blooms daily for 4 weeks in May-June. 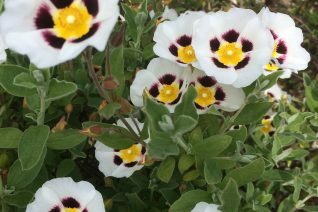 To 2′ x 2′ quickly in RICH well drained soil in full sun. Light summer water. Great performance in the reflected heat of hellstrips. Beautiful in bloom.